Councillor Damian White, Leader of Havering Council, giving a speech at the event on January 17. The joint venture partners recently hosted the first of four ‘Meet the Buyer’ events for local suppliers to learn about contract opportunities on the biggest regeneration project in the borough. 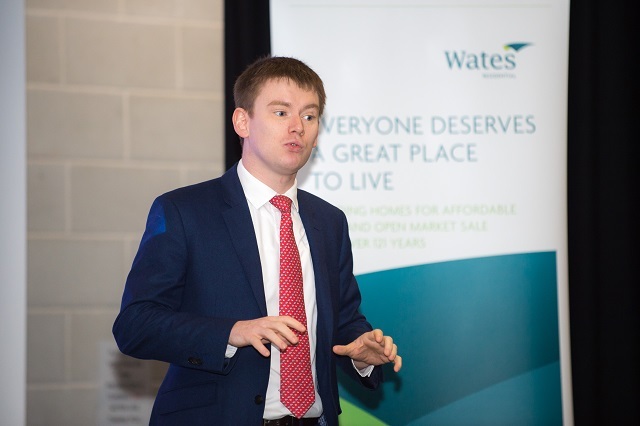 The events are a key part of Havering Council and Wates Residential’s ambition to deliver a borough-wide legacy through investment in employment, education, skills and training. This includes a pledge from the developer to boost the local economy by using local Small and Medium Enterprises (SMEs). This investment will make up a minimum of 10 per cent of the total programme, valued at £100m of contracts to be secured by local businesses. Sourcing local suppliers is also kinder on the environment as it can cut the carbon emissions that are usually produced by travelling large distances. The first Meet the Buyer session, held on January 17 at Havering College, was a chance for representatives from Havering Council and Wates Residential to meet with over 80 people from 55 local construction-related businesses and discuss potential future work on three sites earmarked for regeneration, including the Waterloo Estate in Romford and Napier and New Plymouth Houses in Rainham. Areas where subcontractors could be appointed include: demolition, groundworks, hard and soft landscaping, brickwork, roofing, windows, carpentry, plastering and dry lining, curtain walling, security, design, tiling, painting and decorating, and cladding and lighting protection. Twelve members of staff from Wates Residential were on hand to sit down and discuss the needs of the joint venture project in detail with the local suppliers. The Leader of Havering Council, Councillor Damian White, and Deputy Leader, Councillor Robert Benham, also attended the event alongside Council staff representing its regeneration team and Havering Works; the Council’s new employment and skills service. They met with local tradespeople to explain how they can help businesses to access support and assistance. Three further Meet the Buyer sessions are planned on February 21, February 28 and March 7, with local businesses of all sizes, including social enterprise suppliers, urged to attend if they are interested in getting involved. The events are free to attend but pre-registration is essential and businesses should contact Havering@wates.co.uk if they are interested. For further opportunities, the Council is encouraging local businesses to join the Supply Chain Initiative. Once registered, this ensures that businesses are updated about all the upcoming opportunities in the borough. “We are committed to increasing opportunities for local residents and including them throughout the entire build process. “That’s why we are actively seeking to work with the talented businesses and individuals from the area, who can help us deliver this exciting project alongside Havering Council. “The Meet the Buyer events are part of the wider commitment by the Council and our partners to ensure that our regeneration programmes are about more than just housing. “By encouraging local businesses to register for the Council’s Supply Chain Initiative, they can learn about significant opportunities just like this. By then accessing the support provided by Havering Works, we can help these same local businesses to find and recruit local people looking for work. “This joined-up approach helps everyone – particularly Havering businesses and residents – to fully realise their ambition and potential.